The single most important purpose of education is its aim at transmitting aspects of human experiences in a meaningful way to enrich life.A child, who enters this world, besides learning survival skills, also has to get training in the intellectual, social and cultural aspects of existence .It has to learn the norms and values of group existence .Mrs. Anita Wadhwani, the epitome of virtue, zealous in acquiring the latest in education, constantly working towards newer heights, paved way to the foundation of the Gwalior Glory School in the year 1991. Herself a mother, she realised that a child is full of potentialities - of becoming a poet, a philosopher, a scientist or an engineer. This, she believed she could provide for the children of Gwalior. From a small rented building and limited resources, the school is a strong edifice today on Shivpuri Link Road with a voluminous library, well equipped science laboratories, mathematics laboratory an auditorium to house a thousand students, an activity hall, music room, dance room, art room, a hi-tech computer laboratory and playground with basketball, handball, Kho-Kho, tennis courts and a 200 metre track. The garden of Glory is the cynosure of every eye. 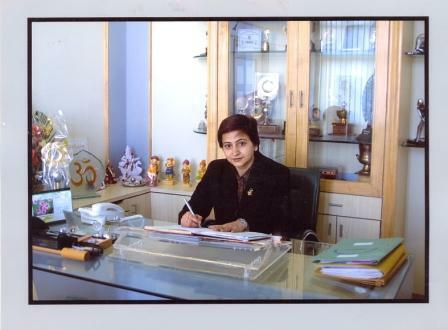 Mrs. Wadhwani has believed in recognizing and encouraging talent and special abilities of the teaching faculty. A careful scrutiny of the teachers is done before appointment and well qualified and experienced teachers are appointed to ensure the all-round development of students.The teachers, on consultations with the management organize activities such as quizzes, debates, excursions, tours, field trips, games, sports, etc. Regular workshops and orientation programmes are arranged to enhance the innate abilities of the teachers. Mrs. Wadhwani encourages the use of the latest state-of-the-art technology to make learning an interesting exercise. A hands-on experience of the realities of life like marketing, visiting the blind home, orphanage and realizing the difficulties they face, visit to public places and heritage sites and museums is what makes students deft in handling situations in their furture life and are likewise arranged. Mrs. Wadhwani says that the righteous way to life is through an objective and a disciplined approach. Development of a strong moral and spiritual character in every child is emphasized strongly. Regular story-telling sessions, screening of movies, making children listen to audio tapes and CDs, throwing them into situations where they need to empathise and not sympathise is what Mrs. Wadhwani believes will make a student of Glory a noble citizen of this country.